On occasion you may have an auto task that needs to occur repeatedly. Rather than creating multiple tasks, you can create one recurring task that will fire off as many times and as often as you wish. This is done in the Recurrence section of the Add New Auto Task screen, as shown in the screen shot below. The Trigger every ____ day(s) field is used to indicate how often the task should occur. For example, if you want the task to occur once a week, you would place a 7 in this field, causing the task to trigger every 7 days. The total of ___ occurrence(s) field is used to indicate how many times you wish to repeat the task. It is important to place a number here, as if you leave this field blank, the task will recur indefinitely. If you want each occurence of the task to be due on a specific day of the week, you can specify this by clicking the drop-down arrow from the Due on day of week field and selecting the desired day. More detail on this feature is provided below. Before you read it, however, you should read the next section to be sure you have a full understanding of how recurring tasks work. When a recurring task is created, this symbol will appear on your task list adjacent to the task name, as shown in the image below. This indicates that the task is a recurring task. The task shown above was the first task triggered in a series of recurring tasks. The task was created to recur monthly for a 3-month period. The image below shows how we created this task. To cause the task to trigger monthly, we set the task to trigger every 30 days. We indicated that the task should recur a total of 3 times, and that each occurrence should take only one day to complete. As with all other auto tasks, when you create a recurring task, you will designate a Trigger to indicate what should kick off the task. This will control when the first task in the series will generate. To calculate the due date of this initial task, Broker Brain adds the trigger date to the number of days specified in the Days to Complete Task field. Each task that triggers after the initial task will then use the recurrence criteria to determine how long to wait before occurring again, and how many more times it should recur. When a recurring task is triggered, you can easily see when the next task is set to recur by clicking on the icon next to the task name. When doing so, a dialog box similar to the one below will appear. At the bottom of the box, in bold lettering, you will see when the next task is set to recur, and how many more recurrences are scheduled following that one. One important thing to note is that the date the task is set to recur is NOT the due date of the next task. It is the due date minus the number of days specified in the Days to Complete task field. This gives the assigned users the time they need to complete the task by the due date. Also included in the box above is the criterion that the task is using to create the recurring tasks. You will see here that our tasks are set to recur every 30 days, and that after the recurrence that is scheduled on February 10th, two future recurrences are planned. Because this task drives the recurrence of the next task, any changes you make to these fields will impact that task, as well as all future task recurrences. To make changes, click in the desired fields, add your information, and click the green Update button. The box will close. 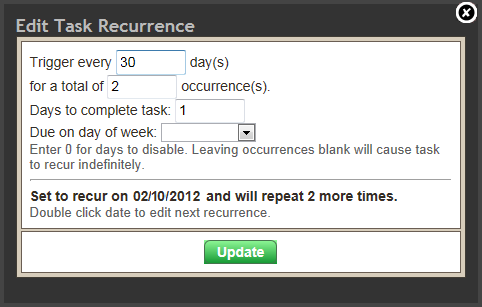 If you click the recurrence icon to reopen the box, you will see your changes, including any date changes made to the next recurrence and any changes in how many times the task will recur. The Due on day of week field allows you to specify what day of the week a task will be due. Tasks set with this parameter will impact both the initial task triggered and all recurring tasks linked to it. In the example below, a recurring task with a 1-day duration was created to be due weekly on Fridays. The initial task was triggered on Monday, August 20th, but because this task is set to be due on a Friday, Broker Brain assigned the due date as Friday, August 24th. If, however, it was already August 24th (a Friday) when the initial task was triggered, because the task requires 1 full day to complete, the initial task would not be due until the following Friday, August 31st. By clicking the button for the above task, we are able to view the scheduled recurrence of the next task, as shown below. This task is scheduled to recur weekly (every 7 days) on Fridays. Because the next Friday is September 1st and this task takes 1 day to complete, the next task is set to recur on August 31st. When you trigger an initial task from Properties>Tasks, be aware that because Due on Day of Week tasks are coded to be due only on the day of the week defined in Admin>Auto Tasks, if you attempt to assign a due date on a different day of the week (using the field shown circled below), Broker Brain will override the date you entered and set the due date on the auto-task-defined day of the week. For example, if you have an auto task that is set to be due on Fridays, but you trigger the task and assign a due date on a Wednesday, Broker Brain will push the task past the Wednesday date you entered and assign the due date two days later, on the closest following Friday. To quickly view recurring tasks that have been generated, click the Home tab at the top of the screen, followed by the Tasks sub tab at left. From there, you can click the My Recurring tab to view recurring tasks that have been assigned to you, or All Recurring to review all recurring tasks that have been generated system wide.